Meditation is one of the best techniques to get rid of stress. A great deal of research is being conducted on this centuries old practice which is now being taken up, increasingly, by top CEOs, celebrities and ordinary people alike. Regular meditation has millions of health benefits which encompass benefits for the mind, body and spirit. There are many meditation techniques and what works for one may or may not work for another. In this guide, we will discuss some of the easy ways to meditate at home. The key principle behind meditation is to stop those frenzied thoughts. However, unlike the common misconception that meditation means “concentrating on not getting thoughts and sitting still”, meditation actually means ‘de-concentration and doing nothing’. Meditation can therefore be defined as the ‘art and science of letting go’. It literally means doing nothing. So staying in the present moment is one of the easiest ways to meditate. Thus, if you are making tea, you can meditate by staying present during the process. Keep all your attention on the boiling water, observing the bubbles as you put the tea bag or pour the water in the cup. Breathe in the flavors and watch the water changing color. Stay in the present moment as you steep the brew. Appreciate and be grateful for the earthy aroma of the tea as you sip it with mindfulness. These are some of the easiest meditation techniques for adults and kids alike. These days, a lot of research has been pointing to adult coloring books and the benefit they can bring in different areas of life. Coloring different patterns and intricate designs using different colors can help block thoughts and relax after a hard day at work. Coloring and drawing is also beneficial for improving memory and concentration. Apart from drawing and coloring, you can try your hand at gardening, walking, staring at the ocean, playing with a pet, dancing to music etc which are all different kinds of meditation techniques. These techniques quiet down thoughts of future and past so your mind remains in the present moment. Meditation requires practice on a daily basis. So it is important to set aside time each and every day for it-no matter how busy you may be. You could meditate early morning before starting your day or evening, after work. 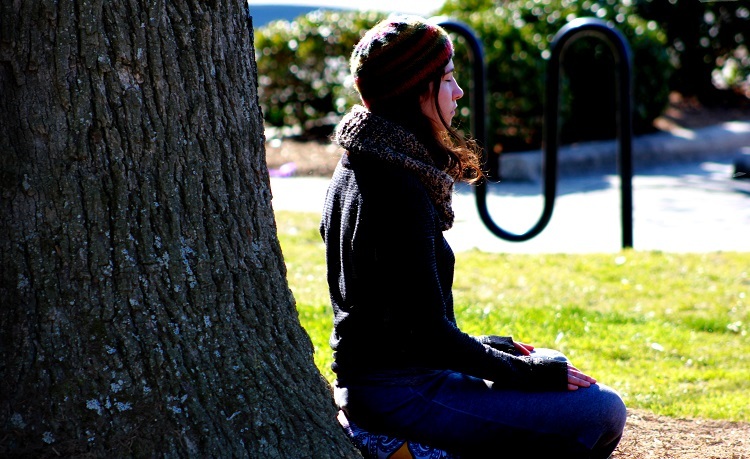 A beginner to meditation could start by setting aside 20 minutes for this activity. As you get better, you can easily set aside 30 minutes to one hour. The positioning for meditation should be such that you are comfortable and relaxed. Sit in a quiet place. Wear comfortable clothes. Avoid meditating immediately after eating. You could meditate 1 to 2 hours after meals though it is best to meditate early in the morning before breakfast or evening before dinner. Set aside a fixed place to meditate. You can sit on the bed but you might fall asleep-which you do not want. You could sit on the floor or on a Yoga mat or rug. Your spine should ideally be straight during meditation but you can use a wall or a pillow as a backrest.Keep your palms open in your lap. You can make hand mudras but it is not absolutely necessary to do so. This is one of the forms of concentrative meditation techniques where you focus on something, in this case, the breath. Breathe in and out-slowly, normally and in gentle breaths. Thoughts may come and go-do not linger on them. Get cozy. Get comfortable. Relax with each outgoing breath and energize the body with each incoming breath. You can also breathe through the nose and out through the mouth. This easy way of meditating is flexible and versatile as you do not need any supplies to do so. You can even do this meditation while traveling (when you aren’t driving). This is one of the proven concentrative meditation techniques which are easy for beginners to meditation. Sit in a dark room with a lit candle. Focus on the flame of the candle. Let the thoughts come and go. Observe the candle flame flickering and steadying itself. Your eyes will water after a while but do this for 10 minutes to still the mind and body. Chanting a mantra repeatedly is also one of the easy techniques of meditation. Chants like I Am Peace, I AM Love or God Is Love etc can be used to bring the mind in the present moment. You can choose any non religious mantra-it does not matter. You can also use a rosary to count the chants. Chanting helps keep thoughts away and clears the mind. Yoga is another technique of meditation where you breathe in and out while doing different poses. This is not an easy way to meditate, because it is important to learn the different asanas correctly first. Failure to do so could even lead to injuries or sprains. Correct breathing is also important as you come in and out of the asanas. There are some great online resources to learn Yoga methodically and step by step. This is a graceful bodywork movement just like Yoga which involves movement and breath coordination. Other body art movements like Qigong and martial arts also help you achieve harmony of mind and body through the breath. These are also great techniques to quiet the thoughts and come in the present moment. To enhance your meditation practice, start each meditation with gratitude. Make a mental list of all the things that are going on right in your life and be thankful for them. Next, sit for your meditation, and you can select any of the above methods like chanting or concentration techniques. Practicing meditation daily in a neutral and religion-free way has helped hundreds of thousands of people transform their lives. With regular practice of these 10 easy ways to meditate, you too can find all that you seek.